We braved the crowds and ear-throbbing sound system to find the best things at the market. Founder Andrew Mayer perfected his recipes working with culinary pioneer Roy Yamaguchi (also known for Roy’s restaurants). The spot serves a variety of poke bowls utilizing Hawaiian techniques combined with Asian ingredients, and guests can build their own bowl while choosing their size according to scoops (3 scoops, $13; 6 scoops, $16), base (white rice, brown rice, zucchini noodles or baby greens), protein, sauce (featuring recipes by Yamaguchi ) and a wide range of toppings, from seaweed salad and wasabi to massago and a poached egg. There are also four bowls for vegans, such as the Purple OG, made with beet-infused purple tofu, edamame, green onions, cucumber, cabbage, ginger soy and served over white rice and baby greens. We loved the Big Island OG: Ahi, sweet onions, green onions, fried onions, cucumber, tossed in Hawaiian OG sauce and served over white rice. Miami’s first Vietnamese deli pays tribute to a classic: the staple banh-mi sandwich. Chef Scott Linquist of Coyo Taco fame is behind the hoagies and prepares everything from scratch, including hoisin sauce, fermented chili paste, mayonnaise, pickles and a dipping condiment called, Nuoc cham. He is also making homemade liver pate, headcheese and cured pork loin for the perfect fillings and cooking some of the meats on a robata grill. Linquist sources the crusty bread from the latest Miami location of New York’s Sullivan Street Bakery, founded by James Beard Award-winning baker, Jim Lahey. Linquist is also working with local butcher shop Proper Sausages, which created a special duck- and Vietnamese-inspired sausage exclusively for Les Banh Amis. Yip, a concept by Pembroke Pines’ Gold Marquees Fine Chinese Cuisine, is offering their award-winning dim sum in traditional bamboo steamer baskets. We liked the plump shrimp variety with just-the-right-pliability wrappers and fresh filling inside. 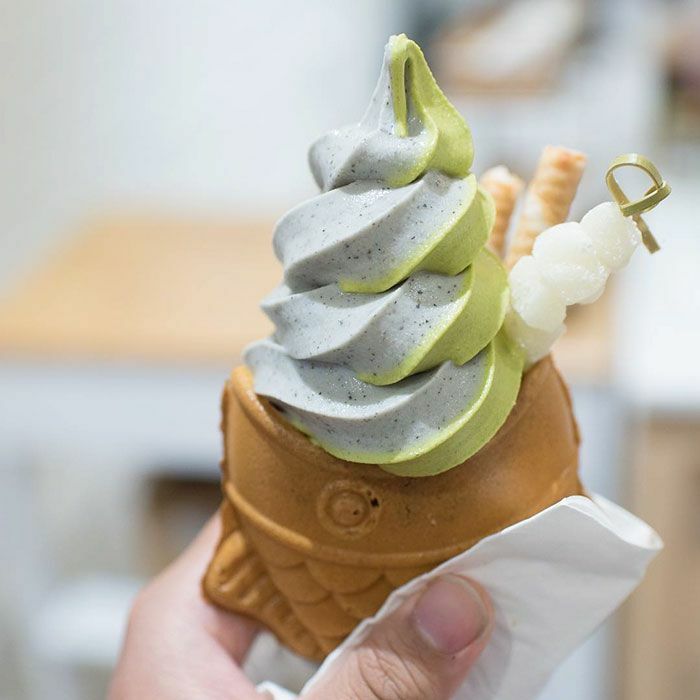 This place is famous for Japanese fish-shaped ice cream cones that have gained popularity in New York City and will basically take over your Instagram. While we loved the flavor and texture of the soft serve we found the signature fish-shaped cone/cake stuffed with red bean paste to be a clumsy and inadequate holder for the ice cream. But then again, no one on Instagram is going to know that.